This quote summarizes the main point being made in What Is the Mission of the Church? : Making Sense of Social Justice, Shalom, and the Great Commission. There are many books addressing the role of social justice and evangelism in the area of missional thinking. Some books argue that good works are “building the kingdom” as you bless the community, but authors DeYoung and Gilbert take issue with this concept. Simply blessing the community with good works is nothing more than good works that any non-profit can do. 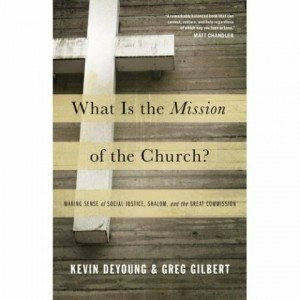 DeYoung and Gilbert lay out a strong case for the mission of the church in their well researched book What Is the Mission of the Church? : Making Sense of Social Justice, Shalom, and the Great Commission. Unlike other missional books that I have read, this book digs deep into scripture and looks at the contexts of passages commonly cited for social justice causes. DeYoung and Gilbert have excellent chapters on these topics, discussing how the church can be faithful in proclaiming the gospel while being involved in the community. Authors DeYoung and Gilbert think these writers are answering two different but highly related questions. The gospel answers both questions. “The Great commission is the mission of the church. I recommend What Is the Mission of the Church? : Making Sense of Social Justice, Shalom, and the Great Commission for pastors and missional community leaders who are thinking about how to engage their community. It’s easy to lose your gospel focus while serving, and this book is a great reminder of the ultimate purpose of our community engagement. Note: The publisher provided me with a copy for review. Order your copy of What Is the Mission of the Church? : Making Sense of Social Justice, Shalom, and the Great Commission (Affiliate link) from Amazon.com.